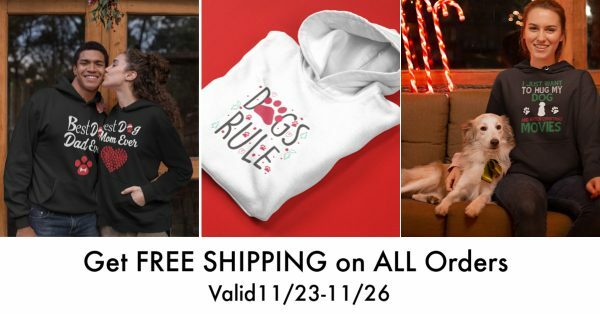 BLACK FRIDAY & CYBER MONDAY DEAL: Get FREE Shipping on ALL Orders at Cat Dog Gifts! Great new, Black Friday and Cyber Monday pers! We’re offering FREE shipping on all orders, any size in our new store, Cat Dog Gifts! This special discount is available all weekend long, beginning at midnight on Black Friday (11/23) and ending at 11:59 on Cyber Monday (11/26). We offer free shipping on all orders $50 and up every day, but for this limited time, there is no minimum purchase required. Now is a great time to try us out and grab that cat lovers mug you’ve been eyeing, or maybe that perfect Christmas hoodie for your favorite dog lover! Head over to Cat Dog Gifts and start your holiday ping for all your favorite pet parents now!